Turmeric is not typically on top of people’s grocery shopping lists, yet this spice is very diverse and offers great health benefits. I must confess, until recently I had never really cooked any meals with turmeric as an ingredient. Until I stumbled upon an interesting recipe that had turmeric in it. Since that moment I’ve been happily experimenting with turmeric and it has slowly become one of my favorite herbs. Did you know that there is white turmeric and yellow turmeric? Although they look quite the same (apart from the color of course), there are actually quite some differences between the two. So let’s dive a little deeper into turmeric, because there’s a lot more to this exciting herb than just spicing up a delicious curry. When recipes refer to turmeric, this is usually yellow turmeric as it’s the most common of the two. Many people aren’t aware that white turmeric even exists. Both yellow and white turmeric are members of the ginger family but there are some differences between the two. White turmeric is often referred to as Amba Haldi, which is the Hindi name for this spice. Native to southwest India, yellow turmeric is the root of the Curcuma longa plant. It has a brown/yellow skin and has orange/yellow flesh. It is often referred to as “Indian saffron”. Yellow turmeric smells a bit like a mix of ginger and orange with a somewhat peppery and bitter flavor. The yellow color is caused by the high levels of curcumin (see further below) in turmeric. Yellow turmeric is mostly known in powder form. The powder is created by boiling, drying, and grinding the root into an orange and yellow colored powder. Be careful when using yellow turmeric (especially the powder form), as it can easily cause stains on your clothes! Often referred to as Zedoaria or Amba Haldi, white turmeric is the root of the Curcuma zedoaria plant. The Curcuma zedoaria plant is native to India and Indonesia, but has also been cultivated in Europe and in the US. White turmeric has lighter flesh and its flavor is very similar to that of ginger, but with a more bitter aftertaste. Although white turmeric nowadays is rarely used anymore as a spice and often replaced by ginger, it is still used in Asian cuisine. In Indonesia, white turmeric powder is often added to curry dishes. In Thailand, fresh, sliced white turmeric is used as an ingredient in salads. And in Indian cuisine fresh white turmeric is also used as an ingredient to popular dishes. Cooking with turmeric can be quite challenging, especially if you haven’t used it much before. Turmeric has a very strong flavor so you need to be sure when to use it and also how much. Another question is also whether to use fresh or dried turmeric. As with anything, fresh is always best, as this way you’ll be able to better enjoy the nutritional benefits. Dried or ground turmeric is of course a bit easier to use. No need to cut anything, just apply it to whatever dish you’re preparing. The drawback is that dried turmeric can lose a bit of its flavor and nutritional content. I typically use fresh turmeric for green smoothies, and let my blender mix it up nicely with other fruits and vegetables. I like to use dried turmeric (powder) to marinade meat, together with other ingredients. I love cooking different meals every day and using turmeric, or other spices and herbs, is often a trial and error process. And the more you experiment, the more you’ll learn about what works and what doesn’t work so well. Another one of my favorites is to add dried turmeric to rice, just to add some color and mild flavor to it. Works great! The other option is to go for turmeric supplements that contain curcumin as the key ingredient. When you buy a turmeric supplement, make sure that you read the label properly as not all turmeric supplements are the same. Be sure to read my article about the ingredients and effectiveness of turmeric and curcumin supplements so you can decide which ones are best for you. One of the most important elements of turmeric is curcumin. The terms turmeric and curcumin often get mixed up even though they are two different things. Curcumin is the most beneficial compound in turmeric and has been used as a traditional herbal medicine for many centuries, mainly in India and China. It is curcumin that has made turmeric so well-known and popular in Asian countries. Western medicine has also slowly been studying the positive effects of turmeric and curcumin on our health. Turmeric root contains around 2-5% curcumin. So if you’re using turmeric powder purely for its health benefits, you would need to consume quite a large amount of powder to make the most of it. It’s more efficient in that case to use a curcumin extract rather than consuming turmeric powder. 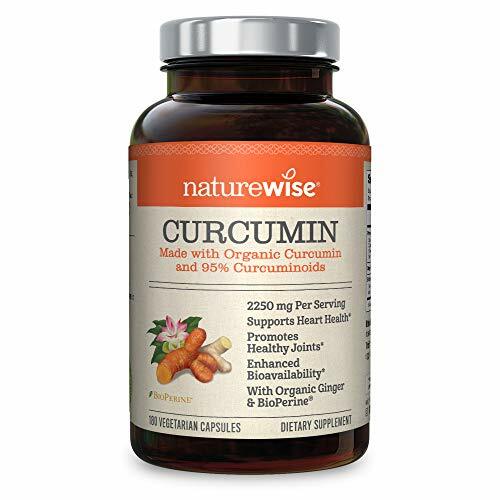 What Are Some of the Benefits of Curcumin? While not all of the health benefits of curcumin have been clinically proven, this compound has been known to reduce (chronic) pain and inflammation and to slow down the effects of Alzheimer’s disease. Studies have also shown that curcumin can be very effective in treating depression symptoms. Curcumin helps to increase the serotonin and dopamine levels in the brain, known as “feel good” neurotransmitters. It must be pointed out that studies have shown that taking large doses of turmeric or curcumin for a longer period of time can have side effects. These side effects include vomiting, nausea and diarrhea. Fresh turmeric can basically be treated the same was as ginger. If you buy a large amount of turmeric and you won’t be using all of it in the short term, you can easily freeze it. Simply cut the roots to smaller sizes and leave them in the freezer. Turmeric won’t lose much (if anything at all) of its nutritional or medicinal properties. I’m actually not sure how long you can keep it frozen, but I’ve had turmeric frozen for more than 2 months and it was still good to use. For shorter term use, you can simply put turmeric in an airtight container or plastic bag and keep it in the fridge for max 2 weeks. Hopefully this post has encouraged you to start experimenting with this very tasty herb. White and yellow turmeric offer some interesting health benefits and there are many different ways to add it to your diet. As a green smoothie fan, I love adding small doses of turmeric (and ginger too!) to my green smoothies. It’s a quick and easy way to enjoy the benefits. Turmeric can also be used as a powerful ingredient in tea. I found this delicious turmeric tea recipe, with turmeric, ginger, black pepper and honey. Works great when you have a bad cold or flu! Good presentation for the Curcuma roots. I am familiar with the yellow turmeric and just recently learned of the white turmeric. There is also a black turmeric, Curcuma caesia. I want to use the fresh roots for their medicinal benefits but all the information about its use is rather vague on the quantity and frequency. I suppose we are just to experiment until the right combination is achieved however; I prefer to rely on the experience of the ancients and their knowledge when it can be found. I am growing the yellow variety but would like to locate the live roots to grow the other two, white and black. Our country’s official lack of concern for anything that isn’t pharmaceutical prevents any reliable research to verify its proper use which is why it’s nice to gather as much information as possible. Thanks for your article. Thanks so much Steve. I had actually never heard of the black turmeric variety so I will have a look into that! We grow yellow, white, and black turmeric on our organic farm in Oregon. I agree it is tough to get information on using the black turmeric. That’s how I found this article, and your comment. We purchased our seed from http://www.hawaiianorganicginger.com/. It is a beautiful plant. If you are in Oregon, you could get some from us. I would love to know if you have found any good information on how to use black turmeric, including dosage, recipes,etc. I just keep finding the same text about treating leprosy, boils, white patches on skin, etc. none of it seems to be applicable to our modern environment. Interested in the turmeric you have mentioned. I’ve been using the yellow and have a couple of plants growing in my greenhouse but also interested in the black and white. I got a handful of Pure White Turmeric about 7 years ago and I grow them in my backyards and I live in San Jose California. I tend to have a lot of heartburn and intestinal tract problems. From time to time I have a lot of stomach pain and also constipate. So I use my homegrown white turmeric to make tea. I roast it with curry leaf then I boil the two together to make tea. I drink that and it take care of the problem plus it help clear up my skin. I noticed the skin on my face is more radiant. I bought some of the white and the yellow turmeric root from a local Indian grocery store today ~$4.00/lb. Whole Foods has the “organic” yellow turmeric root for ~$15.00/lb. Call your local Asian markets to see which varieties if any, they carry. I have just discovered white turmeric which I never knew existed. I will be delighted to send you the roots if allowed by your country, thank you. I would like to grow some white turmeric. Are you able to send the roots either to Singapore or Malaysia? I am currently cultivating yellow, white and black turmeric. More information will follow soon. Since nomenclature is important it should be pointed out that turmeric is a spice not an herb. Spices are from roots, rhizomes, seeds, barks etc while herbs are leaves. Since we are talking about the rhizome here and not the leaf it would be classified as an herb. Tom Denison, would love to buy some samples of those 3 types of organic turmeric. We are caring for our dog with cancer and we need those plants. Thank you. I am going to try and add it to my soup this evening. I was led to buy some fresh turmeric today and I am with a pretty bad cold. Thanks for your help, blessings. I am also interested in buying some white turmeric. How do I contact you? You probably should have explained the most important difference: the nutritive value comparison between yellow turmeric and white turmeric. Since the yellow-orange color generally indicates more anti-inflammatory power in most foods and is one of the big reasons people consume yellow turmeric, one has to wonder if there is nearly as much, if any, in the white turmeric. The white is like ginger and turmeric so less curcumin but other useful phytochemicals. Like ginger and galangal. Turmeric has more than just curcumin. Hi, I’ve been using relatively high doses of raw turmeric root (mostly yellow) for well over six months and every day at that, with an average dosage of 30 grams per day of raw root… I first got into it by researching natural low impact alternative medications for the symptoms of prostatitis, and or early onset of prostate cancer. What I discovered after the initial entree of complications like tummy upsets and a bit of nausea was a dramatic and highly noticeable change in my elimination as everything became much more tenable, with no blockages, almost zero constipation, very good formation of stools (yes there is a chart for this) and urine flow was brought back from a dribble at times to a fairly powerful flow. I’ve been through some rigorous testing regimes for prostate cancer as my family history is not well positioned in regard to it, having lost a number of first grade relatives including an older brother to complications of prostate cancer. I have to say that turmeric has improved my mobility, my blood circulation, and my pain management due to various forms of arthritis due to inflammation and that can’t be a bad thing. It has lowered my prostate specific antigen (PSA) from a high four months ago of 4.6 to 3.8… I have attributed this to my rather excessive intake of raw turmeric root in everything from smoothies to salads to fish dishes. Of course I’ve included this remarkable root rhizome in pretty much everything I consume from coffee to teas to salads… I recently purchased a quantity of white turmeric from our local market and whilst it isn’t as palatable as yellow / orange, I’m finding it just as beneficial if not a little strong and more on the ginger side of things with its zing and it’s bitter after taste that kind of numbs the lips. However I do prefer the yellow varieties for their not so invasive peppery taste qualities and will continue to consume turmeric for the rest of my days… I thoroughly research everything that I eat and I’ve found that turmeric really does stack up. I’ve recently undergone a prostate biopsy to determine the voracity of a couple of shadows that were not signaling too well on the last MRI scan and it will be very interesting to get the results of this sampling to see what, if any affect my diet regime has had over the last six months. I’ll also be re-investigating my prostate gland via a new MRI scan in around six weeks to see what has transpired in this seven months since the last one. I’ll keep this page posted… Kind regards, Ian Lawson, Queensland Australia. Thanks so much for sharing your insights Ian, much appreciated. Your information on yellow-white turmeric to layman is great. Where does the black turmeric stand compared to the better known yellow and white turmeric? I am working on organically grown black turmeric. I have recently been making some mixed fruit jams. As the fruits were all yellow I mixed in some yellow turmeric just to see how it worked. Wow it is a great addition. I don’t use the normal amount of sugar in my jams as I like them tart not sweet. This turmeric mixed fruit jam is a hit at my place. It has loquat, carambola and kumquat. Thanks for sharing Robyn, sounds like something I should try!